1 July 2011 (London, UK) – The online slot machine jackpot at WinADayCasino.com was hit for a record-breaking $225,727 at the height of the unique online casino’s third birthday celebrations last week. The jackpot winner, a practical-minded accountant, says rather than blow the win on holidays and luxuries he’ll do the fiscally responsible thing and use the quarter million dollar jackpot to pay off his mortgage. 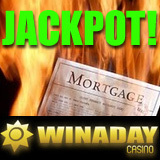 The WinADay jackpot is usually won around the $150,000 mark but has gone much higher several times in the casino’s first three years. In March 2010 it rose to a record $224,420 before it was won by a retired widower. Since all the slots at WinADay contribute to one big progressive jackpot, and since the casino has been particularly busy due to some generous birthday promotions recently, it quickly rose to the record high level after a $167,648 in May. The latest winner, Dereck O., is known as MRBIG on the site and has been playing at WinADay for about a year. Until now he’s divided his playing time between four favourite slot machines: Vegas Mania, Leprechaun Luck, Fair Tycoon and Tropical Treat. Although he said it was hard to pick an absolute favourite from the lot, Vegas Mania will obviously have a special place in his heart after his fantastic luck on that game. Making its debut just over a year ago, Vegas Mania is a five-reel, 21 pay line slot machine where players get up to fifteen free spins, Wild symbols increase the chance of winning and Double Wilds double winnings. Vegas Mania is a high stakes slot machine with a total maximum bet of $84 per spin. Players can win up to 3000 times the betted amount. MRBIG said he’s looking forward to playing the new America-themed “Grand Liberty” slot machine when it launches just after Independence Day. WinADay is an instant casino with 25 online casino games including slots, video poker, Keno and Roulette. If you've played a WinADay please share your impressions in the Comments box below!